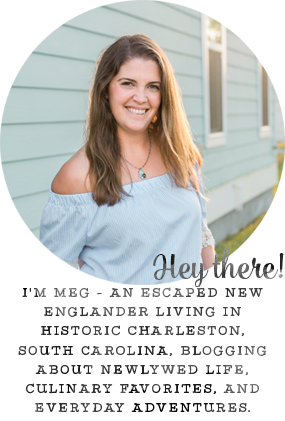 A week ago, I attended another fantastic Charleston Blogger Society event, this time at Finicky Filly! They're a wonderful women's wear shop, owned by a mother-daughter team, located right in downtown Charleston. I had so much fun walking around and looking at the vast array of styles and brands they carry! 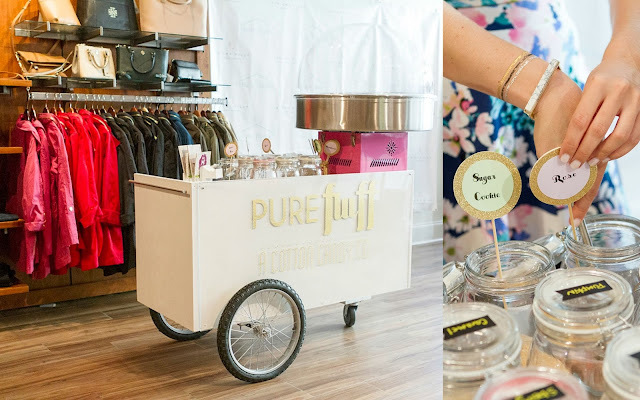 Also at the event were Pure Fluff Co, a natural and organic cotton candy company, and September Oaks Vineyards, a family-owned winery right here in South Carolina. So, while I sipped Family Reserve White and enjoyed some delicious strawberry cotton candy, Director of Digital & Social Media (and fellow blogger) Lanie shared all about Finicky's (and their sister store Hanger to Home's) signature personal shopping experiences: Brown Box Club and Hanger to Home. You might have heard about Stitchfix before? Well, these two delivery services are like that, but even better. Instead of individual pieces, you get 4 complete outfits with Brown Box Club and 5 or 6 complete outfits with Hanger to Home, all put together by their amazing stylists. Interested in signing up? The process is really easy, and the $18 styling fee for the first box is always waived! That means, the first time around, you just keep what you want and nothing else. You start with their style questionnaire (Brown Box Club or Hanger to Home) to help your personal stylist get to know you, then you'll receive hand-picked items delivered right to your door! Want to shop at Finicky Filly or Haute Hanger but more into choosing your own style and can't make it to Charleston? I'd definitely suggest the House Account app! It's truly an interactive shopping experience that allows you to connect directly with your favorite boutiques both over the telephone and instant chat message feature. All four shopping avenues have their own House Account feeds, so head to their respective websites or Facebook pages (Finicky Filly, Haute Hanger, Brown Box Club, and Hanger to Home) to learn more and start shopping. I cannot even tell you how much I enjoyed shopping at Finicky Filly and hanging out with some amazing ladies! Thank you to Gillian Ellis of Coastal Bride for all of the fantastic photos! I wish Philly had blogger events. This looks great! Shopping, cotton candy & wine?! Oh my!! You girls all look fabulous! I love that this is a mother/daughter owned shop and it looks so cute - what a fun night out! Sounds like a really fun event and group of ladies to meet up with! Wow so fun! 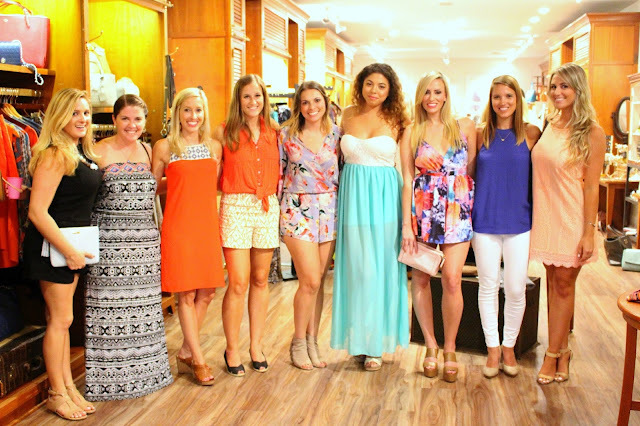 I wish I lived in Charleston, you girls look like so much fun and that shop looks darling! What a fun event-- the shop looks so cute!